Human communication has created a great number of idioms and figures of speech which range throughout every section of the daily life and appear in every situation possible. As this phenomenon indeed shows its importance, linguists have created the field of phraseology to investigate such expressions. Idioms can be a single lexeme, a word group or a complete sentence. People often explain their use as a tool for figurative speech. Many of them are figurative indeed and sometimes simply visually exaggerated. For example, it must be raining very heavily in order to describe it as raining cats and dogs. Idioms vary from metaphorical, polysemic, to opaque or transparent and are often colloquial or cultural. Every country or nation has got their own idioms that are specific to their own culture. Based on language contact and historical events, many idioms have synonyms and equivalent counterparts in several languages. Learning the specific idioms related to a certain culture helps to get to know more about the history, ethics and social values of a certain community. Figurative phrases are peculiar expressions of a language. Looking just only at the literal definitions of the expression's words, idioms often make no sense. Usually, those phrases have a hidden cultural context which only a native speaker of the language and someone who knows the particular culture from which the phrase arose very well, can understand its meaning. All this factors make idioms a significant field of study for theoretical linguists and educators of foreign languages. As death plays a significant role not only in western society but in communities all around the globe, idioms related to death became an important tool in human communication. But what is the actual purpose of using paraphrases in order to relate to death in an utterance? Why do idioms of death have a cultural importance and how is an idiom actually defined? Do certain idioms of death have the same semantic meaning in other languages? 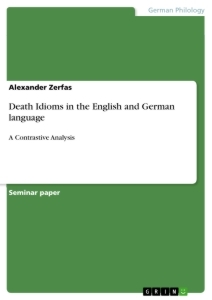 The following paper consists of two major parts, a theoretical framework and a contrastive analysis of idioms of death in the English and German language. The first part deals with the linguistic definition of the term idiom, including possibilities for their classification. The second section of the first part is going to present the concept of euphemism followed by a brief explanation and categorization of metaphors and the attempt of giving possible reasons for the maintaining taboo of death in western culture. The purpose of the second part of this paper is to analyze and compare a number of English and German idioms of death contrastively, in order to identify lexical and semantic similarities, including the investigation of the origin of certain expressions. Subsequently, a short closing reflection will end up this paper. The term idiom which originally derives from the Greek lexeme idios, meaning private or own, is basically referred to the use of figurative speech in everyday language. Idioms include slang, proverbs and common saying and can occur in different forms such as phrases, clauses and whole sentences. Furthermore, idiomatic expressions involve metonymies, metaphors like spill the beans, pairs of words such as cats and dogs; ups and downs and others (cf. Kövecses 2002: 199). From a linguistic as well as traditional point of view, the meanings of idioms are not always entirely predictable. However, among others, metonymies and metaphors are seen as cognitive mechanisms which make a large part of the meaning of an idiom motivated (cf. 2002: 210-211). Idiomatic phrases appear in slang, as well as in formal language, in poetry and also in Bible texts (cf. Seidl and McMordie 1988: 12). Definitions of idioms in different publications often vary largely. According to Fiedler and the Oxford English Dictionary idioms are defined as “a form of expression, grammatical construction or phrase peculiar to a language; a peculiarity of phraseology approved by usage of a language, and often having a significance other that its grammatical or logical one” (Fiedler 2007: 15-16). Therefore, Idioms thus can be determined as expressions which are groups of words with fixed meanings or phrases whose meaning cannot be determined by the literal definition of the phrase itself, but rather refers to a figurative meaning that can only be known through common use. Another short description by Katamba defines idoms as non-compositional syntactic phrases used as lexical items (cf. Katamba 1994: 155). Due to the fact that the meaning of such phrases often cannot be predicted by just taking a look at the separate meanings of the parts, second language learners are likely to misunderstand or simply not identify certain phrases they have never heard of before as idioms. Furthermore, the usage of idioms, catchphrases and proverbs has a huge social importance. Idioms make languages more interesting and allow people to express complex things in a more simplified way. The use of exaggeration, for instance, helps to put emphasis on a specific mental state or different feelings and emotions. Saying I am so hungry, I could eat a horse, for example, naturally excludes the meaning of somebody literally eating a horse. Nevertheless, the person saying this has been able to easily express the state of being hungry and moreover amplify the emphasis on the emergency of the sensation of hunger. In addition, the application of figurative language happens to make the speaker sound very creative and sophisticated, making a lasting impression on the interlocutor. The firmly established presence of those expressions in our everyday life and their manifestation as stable units in human communication can be defined as institutionalization (cf. Fiedler 2007: 21). If such word groups can be easily found in usual dictionaries equal to other expressions, they are considered to be lexicalized. The frequent and common usage of an expression does not necessarily imply the inclusion of it into a dictionary, though. Fiedler describes lexicalization as “the term used to describe the fact that a PU (Phraseological Unit) is retained in the collective memory of a language community” (2007: 21) and as a “fixed and ready-made unit […] recognized and accepted as a part of the language” (21). Idioms can be classified in many different ways. A simple differentiation may for instance be done by the topic of idioms. Katz and Postal however, divide idioms into those which consist of only one word (lexical idioms) and those of at least two lexical items called phrase idioms. Other principles are the categorization by the semantic relationship or morphological structure. A great number of idioms are simple noun phrases like hot potato, whereas others are verb + noun constructions such as kick the bucket or pull someone’s leg. Prepositional phrases as in the long run and phrasal verbs such as put up with are considered to belong to the same way of classification, namely by syntactical composition. Other possible strategies of categorization are for example the dual system of idioms of encoding in contrast to idioms of decoding and lexemic idioms versus sememic idioms by Makkai, or Fernando’s system of literal, semi-literal and non-literal idioms (cf. Liu 2008: 16). The concept of idiomaticity can be subdivided in two main segments. The group of semantically defined idioms consists of metonymies and metaphors whose original images have vanished throughout the time, “unilateral idioms whose idiomaticity seems to be restricted to one of the phraseological elements (e.g. white lie; maiden speech)” (Fiedler 2007: 39), expressions with “additional meaning components that distinguish them from their literal counterparts” (2007: 39)and those like to go places which are formed incorrectly or have “fossilized elements” such in to and fro. Phatic expressions like You’ re welcome, discourse structuring sentences e.g. It was nice talking to you or expressive utterances as What the hell which are determined by their functioning in a conversation, are defined as pragmatic idioms (cf. 39). If someone wants to avoid certain words or topics which are distasteful, unpleasant or embarrassing to talk about, euphemism often comes into play. The term Euphemism in English has its origin in Greek and means to speak (pheme) well (eu) (cf. Hughes 2000: 44). Using Euphemisms therefore means to speak about a situation or topic more positively as it actually is. Euphemisms are thus linked to the process of replacing a direct term with an indirect one (cf. Leisi and Mair 1999: 104). The need of obscuring a certain term or topic and making it sound more nicely is often referred to cultural and social regulations and taboos which are attributed to superstition, religious beliefs or simple decency. Taboos thus regulate socially acceptable manners and set guidelines for social behavior patterns in a certain community. An example for this is the reference to the name God throughout history. In the 18th century people used goles, gosh or golly for God. 150 years later these terms were replaced with Great Scott or Good grief (cf. Hughes 2000: 47). As the used euphemisms became offensive or inappropriate, new expressions had to be created to maintain the taboo. Other examples for tabooed topics in certain communities and cultures are discussions of sexual matter or death. An interesting thing in the field of death euphemisms is that a great number of such metaphors express not a final or peaceful state, but rather a journey or a moving process. Traditional forms are passing away, passing on, going to one’s maker, in Abraham’s bosom or joining the majority (cf. 2000: 45). The opposite of a euphemistic expression is dysphemism, which has a vulgar and abstract character and is a violation of the taboo. Usual dysphemisms for death are pushing up daisies, croak or snuff it (cf. 45). Some vocabulary related to death has lost its original euphemistic quality and has become a standard term in the English language. The undertaker, for instance, had been used as a euphemism around 1700 and became the common expression in British English (cf. 45-46). Allan and Burridge differentiate between three types of “X-phemisms”: dysphemisms, orthophemisms, and euphemisms. Orthophemistic expressions which are formal, direct and carry no connotation are considered to be polite, as well as euphemistic ones, which are more colloquial and figurative than the corresponding orthophemisms. Dysphemistic expressions on the other hand are impolite and offensive and therefore not preferred in social communication which as a result favors the use of euphemisms (cf. Allan and Burridge 2006: 34). Most social interactions require the participants to behave politely with the purpose of maintaining each other’s face. According to this, the use of euphemism can thus be described as “an alternative to a dispreferred expression, in order to avoid possible loss of face” (Allan and Burridge 1991: 11). Due to the previous attempt of giving a brief explanation of euphemism and its function in society, one can see that euphemisms tend to have metaphorical character. According to Aristotle a metaphor can basically be described as an “implicit comparison, based on rules of analogy” (Ritchie 2013: 4). The Oxford English Dictionary whereas, describes a metaphor as “the figure of speech in which a name or descriptive term is transferred to some object different from, but analogous to, that to which it is properly applicable” (2013: 4). To break it down very simply, metaphors can be defined as “a figure of speech in which one thing is compared to another by saying that one is the other” (Kövecses 2002: 7). A very simple example of a metaphor is the extension of a human leg to furniture due to optical similarities as in leg of a table. Additionally, Moon presents a typology subcategorizing metaphors in transparent metaphors, semi-transparent metaphors and opaque metaphors. Based on idiomatic expressions like alarm bell ring; behind someone’s back or to breathe life into something, she explains that if a meaning of a metaphor is such that one can expect it to be easily decoded by the hearer through his or her “real-world knowledge”, the metaphor is referred to as being transparent (cf. Moon 1998: 22). Semi-transparent metaphors, however, do not necessary imply the comprehension of all speakers. Special knowledge of the language and culture is hence needed. Examples for metaphors of that kind are to grasp the nettle or to throw in the towel (cf. 22-23). Opaque or pure metaphors “are those where compositional decoding and interpretation of the image are practically or completely impossible without knowledge of the historical origins of the expression” (23). As suitable examples of this class of metaphors, Moon mentions expressions like shoot the breeze; bite the bullet and kick the bucket (cf. 23). Celtic Connections - How much Celtic is in Irish English?